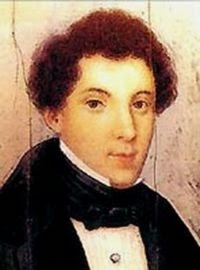 Fifty years to the day of Mozart's birth was the birth of the composer, Juan Crisostomo Arriaga. Juan Arriaga, born in Bilbao-Biscay, Spain is known as the "Spanish Mozart." They not only enjoy the same birthday of January 27 but they also were genius child prodigy's and both died at a young age. Mozart died when he was only 35, while Juan Arriaga died at the extreme young age of 19, 10 days before he was about to become 20. It is thought he died of tuberculosis. It is probably their similar biographies and not their music the reason that Juan Crisostomo Arriaga is known as the Spanish Mozart. Arriaga's music was more in the Romantic than classical mode. Arriaga's compositions sound to me more like Felix Mendelssohn and Franz Schubert than like Mozart. One difference between Mozart and Arriaga is that Mozart was an extremely prolific composer in his young life, while Arriaga, as you would expect dying as a teenager, had some very good but not very many compositions. God only knows how many great compositions Arriaga could have produced if he had lived more years. To get a flavor of this genius teenager's music listen to this thoughtful 4th movement of his string quarter in D-Minor; his beautiful solemn Stabat Mater; and his bright playful symphony in D-Major that has 4 movements: 1. Allegro con brio, 2. Andante, 3. Scherzo and 4. Adagio - Allegretto. Please turn up the volume and enjoy some wonderful music from the Spanish Mozart, Juan Arriaga. Nice music. Hadn't heard of him. Love the symphony clip you posted - one of my favorites. I never knew of this composer until I heard his music played on Radio Swiss Classic online.